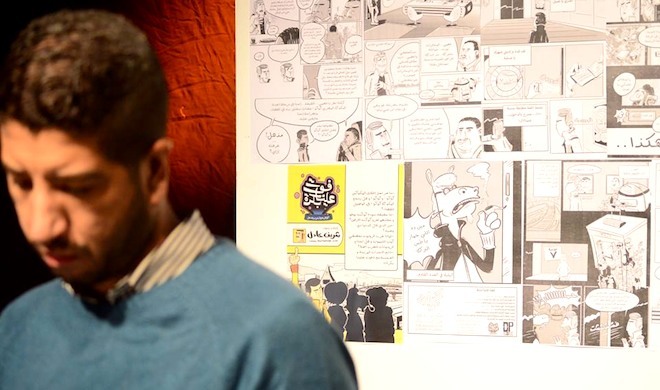 Last week marked the launch of Sherif Adel’s “Foot 3aleyna Bokra” (or “Pass By Tomorrow”), an all-new satirical science fiction comic that will be out every month. Blogger and Arabic literature expert 'ArabLit' got an interview with Adel about his latest venture. The fun, campy “Pass By Tomorrow” — set in the year 3104, and featuring the not-altogether-heroic Fahmi — was recently launched at Townhouse Rawabet next to Cairo’s Townhouse Gallery. This is author-illustrator Sherif Adel’s (@barbatoze) first serialized comic story, and he’s opened up with a bang. The first issue is fun, cleanly and brightly drawn, with fumbling, larger-than-life characters and a fast-moving story, good for ages 11-111. This work could easily draw in new adult readers, as well as older children, with its engaging humor and expressive drawing work. The plan, Adel says, is to have out each new issue on the first Wednesday of the month and a launch event on that Friday. And for those of you who are not in Cairo, the publisher has just revealed that there’ll be an e-book version as well. Luckily, we got a brief interview with Adel about what he’s got in store. ArabLit: So was Pass By Tomorrow written in the far future and transported back to you to transcribe for us? Sherif Adel: I’m afraid that’s classified information, let’s just say it involves a time machine, a fake moustache, and a falafel sandwich. AL: Why the history of the future? For camp/humor value? Just because it’s more fun? Because you’re freer to comment on anything you like: past, present, future? SA: “Where is Egypt heading to?” is a question that we have been asking ourselves over and over during the past few years and – in my experience at least – we’ve been slowly realising that nothing major is actually changing. Corruption, misbehaviour, harassment, bad traffic, political indifference, and pretty much everything is settling back into place. So Pass By Tomorrow is my answer to an extension of that question, “How will Egypt be like in 1,000 years?” In my opinion, it will also be about the same. Our chaotic foolish half-assed way of dealing with our problems and the world will prevail. On the bright side, we get a lot of surreal comedy on a day-to-day basis; so there’s always that. AL: What are the “red lines” of the future? SA: No red lines per se, except for my personal red lines of not including obscenities and sexual content in my work. AL: What are your inspirations? Ø³ØªÙØ¨Ù – The Future File” by Dr. Nabil Farouk. They are science fiction novellas that were insanely popular in the Nineties, and I’d go as far to say they introduced a whole generation (myself included) to science fiction and to the hobby of reading itself. Ø³ØªÙØ¨Ù, but yeah I wouldn’t consider it just a parody anymore. AL: Do you have the whole story mapped out? Or rather, has it all been transported from the future to our time? Or is it coming in pieces? SA: I have the story mapped out, but I’m re-adjusting and tweaking the plot as I go along. I’m planning on using the monthly issue format to be able to get a feel for what people are expecting, enjoying or disliking with the feedback that I get. AL: I’m not sure of my confidence in the Egyptian intelligence services of the year 3014. AL: No girls in the story yet! Well, except our very helpful office admin and the holo-radio lady. Are there women in the future? Does Fahmi have a lady-friend? SA: Yes, Sahar -Ø³Ø­Ø± – one of the 4 major characters is a lady. The first issue was building up the setting and introducing the reader to the world through the protagonist. The rest of the team are introduced with the 2nd issue. AL: Are tales of 3014 for readers of all ages? Thus far, I’d say they’re for anyone 11-111. SA: My intention, as is with the rest of my work, is that anyone of any age can grab a copy and enjoy it. That being said, I would assume that people who spent their childhood in the Nineties will get most of the references and jokes. An interest in SciFi and pop culture would help as well.